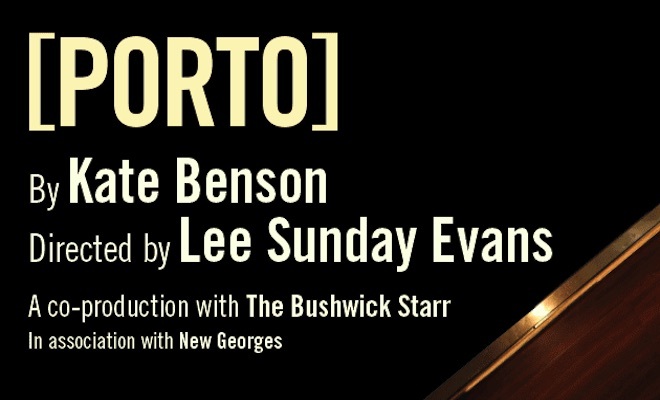 New York, NY – WP Theater (formerly known as Women’s Project Theater) and The Bushwick Starr, in association with New Georges, are pleased to announce the cast and dates for the Off-Broadway premiere of [PORTO]. Written by Obie Award Winner Kate Benson (Super Magic Wild Forest, Desert) and directed by Obie Award winner Lee Sunday Evans (Bull in a China Shop, Caught), the play will star Noel Joseph Allain (Luft Gangster, Queerspawn), Kate Benson, Ugo Chukwu (Ripcord, JOB), Jorge Cordova (Moment of Zen, Hillary), Leah Karpel (The Harvest, Pocatello) and Julia Sirna-Frest (Welcome to the Gun Show, A Tunnel Year). [PORTO] will begin performances at WP Theater (2162 Broadway) on Sunday, January 28 and run through Sunday, February 25, with opening night set for Tuesday, February 6. A woman walks into a bar. Her name is Porto. She’s a regular. She likes this bar: serious food, serious wine, serious bartender–a staple in a gentrifying Brooklyn neighborhood (perhaps Bushwick?). Her friends, her wine, and her artisanal snacks are there; her doubts about being a Modern Woman are put on snooze. A handsome stranger walks in and orders something special. Disruption ensues: an upside-down romantic comedy unfolds inside and outside her head. Desires of all kinds are awakened with a ferocious thump. A nice smile is a nice smile, but can we enjoy the sausage once we know how it’s made? [PORTO] reunites Benson and Evans, whose last collaboration, the Obie Award-winning A Beautiful Day in November on the Banks of the Greatest of the Great Lakes, was a smash success at WP Theater in 2015. Tickets for [PORTO] are now on sale via http://wptheater.org/tickets/(212) 765-1706. The performance schedule is as follows: Tuesday-Thursday at 7pm; Friday at 8pm; Saturday at 2pm & 8pm; and Sunday at 3pm. KATE BENSON (Playwright, Performer) is a writer and actor living in Brooklyn. Plays include: [PORTO] (The Bushwick Starr), A Beautiful Day in November on the Banks of the Greatest of the Great Lakes (Obie winner), (New Georges with the Women’s Project Theater), Super Magic Wild Forest (Clubbed Thumb Biennial Commission), and Desert (for Now). She has an MFA from the Brooklyn College Playwriting program. Performances include: I’ll Never Love Again (Bushwick Starr), Tiger, Tiger (on the Nature of Violence) (Dixon Place), Fondly, Collette Richland (Elevator Repair Service at NYTW), Nomads (the Incubator), Good Person of Szechwan (the Public & LaMama), and home/sick (the Assembly). LEE SUNDAY EVANS (Director) Recent Credits include: Bull in a China Shop by Bryna Turner (LCT3), [PORTO] by Kate Benson (Bushwick Starr), Caught by Christopher Chen (Play Co.), Macbeth (Hudson Valley Shakespeare Festival), Wellesley Girl by Brendan Pelsue (Humana Festival), D Deb Debbie Deborah by Jerry Lieblich (Clubbed Thumb), A Beautiful Day in November on the Banks of the Greatest of the Great Lakes by Kate Benson (OBIE Award – New Georges/Women’s Project). Her work has been presented/developed at: Baryshnikov Arts Center, Sundance Theater Lab, BAX, CATCH, LMCC, Robert Wilson’s Watermill Center, Juilliard. Lee received the 2016 Susan Stroman Directing Award from The Vineyard Theater. Upcoming: Miller, Mississippi by Boo Killebrew (Dallas Theater Center), Dance Nation by Clare Barron (Playwrights Horizons). JORGE CORDOVA Theater: [PORTO] (Bushwick Starr, upcoming: Women’s Project/New Georges), Universal Robots (Gideon Productions/Sheen Center), Lady Day (The Little Shubert), Family Play: 1979 – Present (Collaboration Town), Bonedive Scrounger (The Brick). Television: “Seven Seconds” (Netflix, Fall 2017), “Blue Bloods” (CBS), “Madame Secretary” (CBS). Film: The Visit. LEAH KARPEL Off-Broadway: The Harvest (LCT3); Pocatello (Playwrights Horizons); [PORTO] (Bushwick Starr). Regional: Miller Mississippi (Dallas Theatre Center); Residence (Actors Theatre of Louisville Humana Festival); Appropriate, The Whale, We Are Proud to Present…(Victory Gardens Theatre); Buena Vista, The Glass Menagerie, The Hot L Baltimore (Steppenwolf Theatre); The Diary Of Anne Frank (Writers Theatre); The Commons of Pensacola (Northlight Theatre); 4000 Miles (Long Wharf Theatre); Punk Rock (Griffin Theatre); Ten Chimneys (Milwaukee Repertory). Film/TV: Chicago Med; Patriot; Olympia. WP THEATER (formerly known as Women’s Project Theater) is the nation’s oldest and largest theater company dedicated to developing, producing and promoting the work of female-identified and trans theater artists at every stage in their careers. For nearly four decades we have served as leaders at the forefront of a global movement towards gender parity, and the example we set and the artists we have fostered have grown into to a robust and thriving community of artists in theater and beyond. WP empowers female-identified artists to reach their full potential and, in doing so, challenges preconceptions about the kinds of plays women write and the stories they tell. As the premiere launching pad for some of the most influential female theater artists today, our work has had a significant impact on the field at large. Nearly every prolific female theater artist has been through our doors, including Eve Ensler, María Irene Fornés, Katori Hall, Pam MacKinnon, Lynn Nottage, Leigh Silverman and Anna Deveare Smith. These powerful women found an early artistic home at WP, and are a testament to our role as a driving cultural force. WP was founded in 1978 by visionary producer, Julia Miles, to address the significant under-representation of women in theater. Today, WP accomplishes its mission through several fundamental programs, including: the WP Lab, a two-year mentorship and new play development program for women playwrights, directors, and producers; the Domestic Partner residency program; the Developmental series; and the Main Stage series, which features a full season of Off-Broadway productions written and directed by extraordinary theater artists. THE BUSHWICK STARR is an Obie Award-winning nonprofit theater that presents an annual season of new performance work. We are an organization defined by both our artists and our community, and since 2007, we have grown into a thriving theatrical venue, a vital neighborhood arts center, and a destination for exciting and engaging performance. We provide a springboard for emerging professional artists to make career-defining leaps, and we are a sanctuary where established performance companies come to experiment and innovate. Our past seasons have included new work from groundbreaking artists such as The Mad Ones, Clare Barron, Dave Malloy, The Debate Society, the TEAM, and Half Straddle. New Georges, founded in 1992, is a strategically small theater company with a national reputation as a productive home and launchpad for exuberantly theatrical women artists – individually, as collaborators, and as a community. We cultivate our boundary-pushing aesthetic in a nimble, artist-driven production environment: committing to projects early on, equipping them with processes rooted in strong collaborations, and providing steady artistic support. We serve and sustain the largest ongoing working community of women theater artists in New York City — more than 200 playwrights, directors, actors and designers – with premiere productions; play and artist development programs (such as the New Georges Jam and the Audrey Residencies); and The Room, our permanent workspace and the year-round hub of our activities. Our 22-year commitment to providing our artists with free or low-cost workspace in The Room is unique among small theaters and has incubated thousands of new plays. Honors for New Georges, our plays and our people include 3 Obie Awards, the Lilly Award, the Susan Smith Blackburn and Kesselring Prizes. And the influx of New Georges artists into the field over the last 25 years has had marked impact on the representation of women nationwide in theater, film, television and arts education.